Which Group Buying Site is Best for Cause Marketing? Frank Barry had a wonderful post last week over at Mashable on seven group buying sites using daily deals to give back. It's a must read for cause marketers because this is a new area of opportunity for win-win partnerships between causes and companies. But all daily deal sites are not ideal for your cause marketing business plan. Here's my pick for the best and my thoughts on the rest. Like all the other group buying sites, GoodTwo has a sales team to land the deals with businesses and a platform to share them with consumers, but what's different is it offers them to nonprofits and individual fundraisers (with a focus on those who raise money for runs, walks and rides) to use with their contacts. As GoodTwo explained to me in a phone conversation, they're not building a database--unlike Groupon which has 35 million registered users--they're providing a platform that combines commerce with cause and contacts (your contacts, not theirs) to raise cash. My favorite part about GoodTwo is that the success of your daily deal is really up to you. GoodTwo even lets you submit your own deals--a good opportunity for a cause that doesn't mind rustling up its own deals, which will probably be better and mean more money for your cause. If you're a good size nonprofit with a decent email list you can solicit your own deal and use the GoodTwo platform to share it with your supporters. This site allows users to vote up or down charities they'd like to see featured on the site. Then they're on for a week. Occasionally, they allow charities to offer their own deals. But here's the challenge with D4D and other sites like it: You don't control it. Someone else runs the show and your cause, if chosen, gets one and is done. That's great, but if you're like me you want a sustainable fundraising solution not a one-time handout. 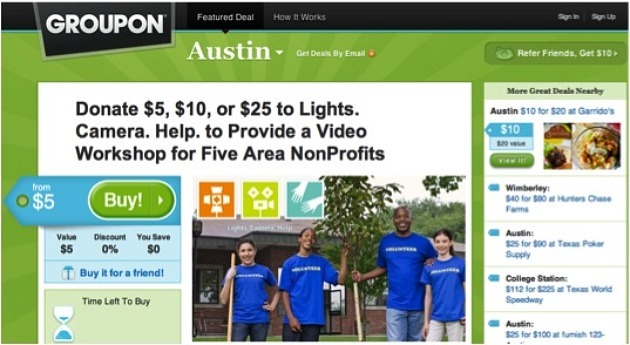 If you can get your nonprofit featured on either Groupon or Living Social your success is almost guaranteed. Combined, the two sites have raised over $250,000 for Donorschoose.org. Frank reports that in Los Angeles NPR raised $11k after Groupon took its cut. But I'm surprised in Austin that Lights. Camera. Help. only raised $150 with Groupon. All these group buying sites are great, and I would work with all of them if they asked, which is exactly why I recommend GoodTwo because you're not waiting for the phone to ring. GoodTwo give you a platform to create your own deals and will even get you the deals if you can't get your own. What it doesn't have is its own database, which is major asset for sites like Groupon and Living. You need businesses that will give you deals. GoodTwo already has deals from local businesses that you can use, but your deals may be better and raise more money for your cause. You need a good database of contacts to send your daily deal to. This is critical as the success of your campaign will depend on the people who receive the offer. You won’t receive all the money, even if you solicit your own deals. You’ll always be sharing some porting with GoodTwo. That’s the cost of having a partner. If you have these things, especially a strong database, I'd go for it. It will be GoodTwo: good for you and good for your supporters.